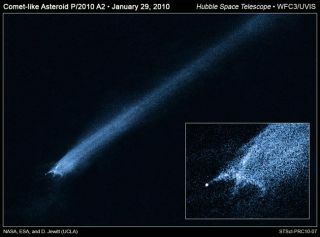 A Hubble Space Telescope picture of a comet-like object called P/2010 A2 shows a bizarre X-pattern of filamentary structures near the point-like nucleus of the object and trailing streamers of dust. Scientists think the object is the remnant of an asteroid collision. A mysterious trail of debris spotted in space suggests two asteroids recently slammed into each other. Though such space rock collisions are thought to be common, direct evidence of the cosmic smashups has never been seen before. New images from NASA?s Hubble Space Telescope, however, have caught the suspected collision on camera. An X-shaped debris pattern was observed by Hubble on Jan. 25 and 29. The pictures, released today, show a comet-like object, dubbed P/2010 A2, with the X-pattern of filamentary structures near the nucleus. "This is quite different from the smooth dust envelopes of normal comets," said study leader David Jewitt of the University of California at Los Angeles. "The filaments are made of dust and gravel, presumably recently thrown out of the nucleus. Some are swept back by radiation pressure from sunlight to create straight dust streaks. Embedded in the filaments are co-moving blobs of dust that likely originated from tiny unseen parent bodies." The two asteroids likely smashed into each other with an average impact speed of more than 11,000 miles per hour, or five times faster than a rifle bullet. The Hubble photos show that the main nucleus of P/2010 A2 lies outside its own halo of dust. This pattern has never been seen before in a comet-like object. The nucleus is estimated to be about 460 feet (140 meters) in diameter. Scientists think this nucleus is the surviving remnant of the collision, and the tail is the rubble left over from the crash. P/2010 A2 orbits in the warm, inner regions of the asteroid belt between Mars and Jupiter. When the object was observed, it was approximately 180 million miles (290 million km) from the sun and 90 million miles (145 million km) from Earth. The Hubble images were captured by its new Wide Field Camera 3, which was installed during the May 2009 space shuttle servicing trip. The camera can spot house-sized fragments at the distance of the asteroid belt.